The bunting was pretty easy. I mixed Tylose powder with the fondant and cut the holes before it dried. Once it was dry stringing the ribbon was no problem. I attached the ribbon with straight pins. I wasn't at the party, but apparently ribbon is a fire hazard on cakes. Thought you might want to know. ooooh! Love me some bunting! And on a cake? Yum! I actually like your design better than the one you replicated! I love it! The bunting is so cute! ha ha! ribbon fires on cakes sound fun! it looks awesome!! sorry about the fire hazard!! So cute! Great job Kalleen!! ROFL that cake is awesome! But your ribbon on fire comment reminds me of my 7th birthday when my mother made me the most beautiful maypole cake with tiny people and ribbon streamers...which then caught alight LOL. So cute! I'm just obsessed with bunting right now, and garlands of all kinds! I've been working on my plan for my son's first birthday cake, maybe this is the answer for the middle tier! I'll be using your recipe for marshmallow fondant again, such a great recipe! I love this!! I make my birthday cake every year (because I am a perfectionist sometimes) and want to try fondant. I am so inspired by fondant cakes! I love the banner idea, I'll have to bookmark this one!! Stopping by from Lucky Star Lane!! 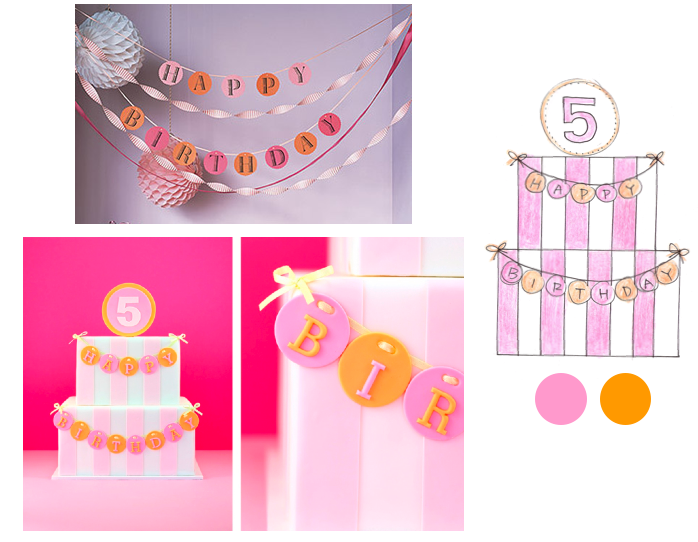 Love the idea of a fondant pennant banner! Totally doing that soon :).